There are joint international conference in Universitas Sebelas Maret (UNS) Surakarta. 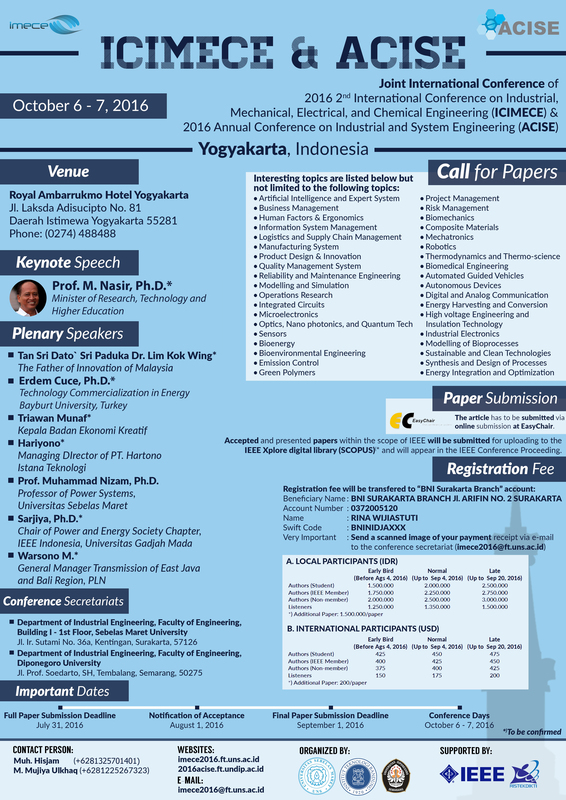 The first “International Conference on Industrial, Mechanical, Electrical and Chemical Engineering”- IC-IMECE (formerly known as IMECE) was held in 2015 while the first “Annual Conference on Industrial and System Engineering”- ACISE was held in 2014 as a domestic conference. This year, these two conferences are joined together to be broad, widely provide opportunities for the different areas to exchange new ideas and also experiences, as well as to establish business or research relations and to find global partnership for future collaboration in the fields of Engineering. Considering many requests for the extension of full paper deadline, the committee would like to inform that the full paper submission deadline has been extended to Monday, August 15th, 2016, instead of the previous announcement informing July 31th, 2016. · All accepted and presented papers will be published in the conference proceeding with ISBN Numbers. · The papers within the scope of IEEE shall be submitted to the IEEE Xplore Digital Library and SCOPUS for indexing after peer review process.